Wirelessly connect up to 2 smartphones or tablets and take turns playing music with exceptional 360° sound. The built-in rechargeable Li-ion battery provides up to 12 hours of playtime with music and light show. 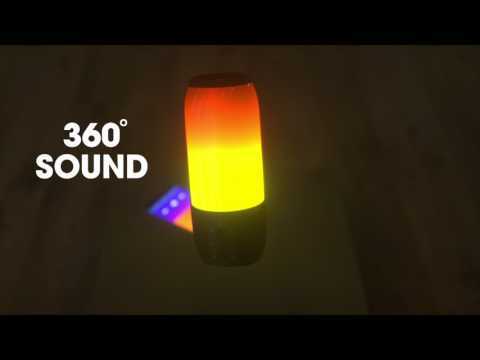 JBL Pulse 3's customizable 360° lightshow sets the atmosphere by bringing your favorite songs to life. No more worrying about the Pulse 3 getting wet due to rain, spills or submersion in water. Amplify your listening experience and build your own party by wirelessly connecting more than 100 JBL Connect+ enabled speakers. With the noise and echo cancelling speakerphone you can take calls from your speaker with a touch of a button - crystal clear. You can make your music look amazing by customizing the light sequences and easily adjust your settings with the JBL Connect app. Access Siri or Google Now from the speaker with a simple button press. Take your listening experience to the next level with the JBL Pulse 3, the portable, waterproof Bluetooth speaker that combines 360° sound with 360° lightshow. Bring your music to life with glowing LEDs wherever you are. With a built-in rechargeable battery that delivers up to 12 hours of playtime and an IPX7 waterproof housing, Pulse 3 is perfect for worry-free listening by the beach or pool - or even in it. With JBL Connect+ technology, you can wirelessly link more than 100 JBL Connect+ enabled speakers to amplify the party. Pulse 3 also features a noise and echo-cancelling speakerphone for crystal clear calls. Simply shake the Pulse 3 to create a synchronized lightshow with other Pulse 3 devices. Customize your lightshow experience at the tip of your fingers with the JBL Connect app. Pulse 3 is rated 4.2 out of 5 by 194. Rated 5 out of 5 by Mzacuna from I bought this for my daughter for Christmas and she loves it! The sound is really good too. Rated 5 out of 5 by cletori3 from Overall amazing I received this for my birthday mid-july. I have dropped it, no scratches. I have had it at the beach and by pools and there is absolutely no damage. Very loud even at half volume. Love the colorful display, my favorite is the rainbow. I would 100% recommend purchasing this. Rated 5 out of 5 by Jdawg1157 from I love the quality I love this speaker i would love to know how resistant it is to the cold. Do the lights cause radiation of some sort.&nbsp; Even with Bluetooth is this completely safe to use? The LED lighting used in this device is technology used in modern light bulbs as well as the backlighting in smart phones, computers, tablets, and TV sets. The top part is not made of glass. It is made from composite materials. Unfortunately, at this time there is no option to sync both light shows on the Pulse 3 speakers. Can this play underwater as it is seen in the photos? Hi, I just bought Pulse 3 and I have a firmware upgraded Charge 3 (to support connect+). Even after upgrade I cannot link the two speakers to each other through connect+. Are there any known issues? The JBL Charge 3 is only capable of JBL Connect as of the moment. There has been no updates yet to the Charge 3 to be compatible with the JBL Connect+. The Battery of the Pulse 3 lasts up to 12 hours (varies by volume level and audio content). If you don't have the lights on and still get 3 hours then ,please submit a case request at www.jbl.com/support-contact.html and the Customer Service team will be more than happy to further assist you. Is it safe to keep the Pulse 3 charging at all times while displaying its light show? Yes, it is completely safe to leave the PULSE 3 connected to the power whether it is in use or not. Take note that using the PULSE 3 while plugged in will prolong the charging time. can i turn off the light show if i get tired of it? Yeah, just press and hold the light button, on the speaker, for over 2 seconds and it turns off.